Houlihan’s menu prices on this page. Houlihan’s started when two restaurateurs partnered up in the 60s to build an all-American restaurant, which was low-key and reasonably priced. Reconstructions, expansions and menu changes later then made Houlihan’s a strong American restaurant chain with over 48 restaurants in 15 states. This restaurant gained fame with its grilled steaks and flatbreads. There is no “atmosphere” in Houlihan’s because it’s a place to just chill down, as proven by their many happy hour awards. Join the Foody Call Club and Houlihan’s will text you about local events and discounts. Too many text messages going on at once! No worries. You can join the email club to stay connected. All Burgers And Sandwiches Are Served With Your Choice Of Side. The changes in the menu in 2006 brought Houlihan’s to a higher level of food invention but retaining their comfortable and personable service. They even changed their sources, as they are only getting from farms with traditional farming practices, making sure that their sources are not chemical and pesticide packed. They even have selections for gluten-free and vegetarian food, making sure that they do cater to every person’s food preference. Rave reviews were given to their famous Seared Georges Bank Scallops, served with a creamy and lemony risotto. Another dish that received good reviews is the Creekstone Farms Meatloaf, which is made with grass-fed Angus beef. This dish was served with smashed potatoes and onion strings. For lunch, the best bet would be the sandwich combo, served with an option of fries, beans with dip, or tortilla chips. Another must-try is the Sliders. Happy hour is also their specialty. Disco Fries or a baked fries in wine gravy is superb with freshly sourced beer from Rockmill Brewery, Estrella Damm, and Hoppin’ Frog Brewery. 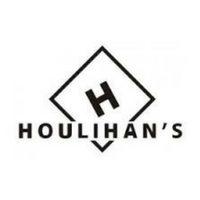 For more information about Houlihan’s, visit their official website.